Find here all the frequently asked questions. Do you always add new blood to your stock? We always introduce a bit of new blood in order to keep the inbreeding coefficient normal and in conformity with the Anima Québec and International Guide Dog Federation standards. Each performance of the males and females is registered to facilitate genetic decision-making. How do you decide if a female will be a breeding female? Females are evaluated for one week and their health is assessed. If the female meets the criteria sought in a guide dog and has a perfect bill of health, she may become a breeding female. Can all dog breeds help people in need? At the Mira Foundation, we mainly work with the Labrador and Bernese mountain dog mix. This hybrid produces an excellent dog: the Labernese. What happens to dogs that are not selected? Mira dogs that are not selected in any of our training programs are offered to the public in exchange of a donation. We prioritize the foster family that took care of the dog during its first year of life. If the foster family to not wish to take back the dog, we contact the people on our waiting list. The dogs that are not selected are always sterilized and received all of their vaccines. Some of them may have received a basic training. If you wish to register on our waiting list or if you want to have more information, please contract Mrs. Sylvie Canuel at 1-800-734-6472 #266 or by email at scanuel@mira.ca. Does Mira intend to offer rehabilitation dogs for abused women? In the long-term, yes. This could be a future vocation for our dogs. How much time is required to train a Mira dog? It varies from five to eight months, depending on the program to which the dog is assigned. Does Mira intend to donate dogs to military personnel suffering from post-traumatic stress disorder? This idea is part of the organization's long-term goals, but since we are at full capacity in our current programs, we can’t create a new program for the moment. Does Mira train dogs for people who suffer from epilepsy? If I have my own dog or if I want to buy one, can Mira train it? Mira has its own dog breeding program to assist people with visual or motor disabilities or youth with ASD. The Mira Foundation does not train outside dogs, even for people with disabilities served by the Foundation. Does Mira adopt dogs that aren’t bred in your facilities? We very rarely adopt dogs that we haven't bred. The dogs must be purebred, must not be spayed or neutered and must conform perfectly to our standards of excellence. We know by experience that some lines, though they are good companions, are not fit for our programs (too active, too much nose, health problems, etc.). If you want us to adopt your dog, the first step is to send us the dog's pedigree by fax at 450-795-3789 or by email at info@mira.ca. After its pedigree is reviewed (more or less two weeks), the dog's physical compliance and temperament will be assessed by our professionals. During this visit, if the dog is five months old or older, an x-ray will be taken to check for hip dysplasia. For reproduction, we only accept dogs with good or excellent compliance. If the dog is ten months old or more, we will keep it for more or less two weeks for regular assessments. If a puppy is less than five months old, we will decide on the basis of its physical compliance and temperament. If the dog passes all these tests, we will accept it in the large Mira family. Mira reserves the right to refuse any dog at all times. Is Mira recognized as a charitable organization by law? Yes, Mira is registered as a charity with the Canada Revenue Agency. Its registration number is 11892 4232 RR0001. How many people does Mira help each year? Mira donates an average of 200 dogs per year through its three programs, namely: guide dogs for the blind, service dogs for people with reduced mobility and service dogs for youth with Autism Spectrum Disorder (ASD). Why don't you train more hypoallergenic dogs, like the poodle? It isn’t a dog’s fur that causes allergies, but the protein in it’s saliva. We use the Labernese, a Labrador and Bernese mountain dog mix, which is not a breed, but a hybrid we created. In the past, we also used Golden Retrievers, Golden/Labrador mixes and standard Poodles. Where does the name “Mira” come from? What is required to be a drop spot? Being accessible for people to come to your business to drop off their cartridges. Having fixed business hours when people can go. Having an employee present that can direct people to the Mira drop box. Allowing us to list your company's address and phone number on our website, as a drop spot. I have just one cartridge, can I send it to you anyway? You can drop it off at one of our drop spots. Why are some cartridges non-recyclable? Mira can’t recycle certain cartridges, because for the moment there is no collector or recycler that buys them. Is my printer cartridge recyclable? The Mira’s Foundation cannot recycle all cartridge’s models available on the market. Once sorted at our warehouse, your cartridges are resold to recyclers and cartridge recyclers that refill them and put them back on the market. Some models have unfortunately not found takers to be marketed again. Although the Mira Foundation is still actively seeking new partnerships with recyclers, some cartridges remain unrecoverable. The cartridges recoverable by the Mira Foundation are all models of Lexmark laser cartridges, whether original or recycled, original laser cartridges only for Hewlett-Packard, Brother, Samsung, Dell, Canon and Xerox and all Hewlett-Packard inkjet cartridges. The cartridges not recoverable by the Foundation are all models of compatible or recycled laser cartridges, "home" brands like Staples, Grand and Toy and others, original Ricoh, Toshiba, Sharp, Kyocera, Okidata and Konica Minolta branded laser cartridges and all powder containers and plastic tubes. Can participants in fundraising activities get tax receipts? As a registered charity, Mira can issue receipts for donations. A tax receipt is automatically issued to people who make donations of $20 or more. For donations of less than $20, a tax receipt is issued upon request only. Activity organizers must provide a complete list of donors including their personal information: first name, last name, mailing address, payment method and the amount of the donation. IMPORTANT: Organizers must consult with Mira before promising tax receipts to contributors and participants, because certain conditions apply. Note that it is Mira who issues the receipts to donors. Is it possible to make a donation in honour of a person? If you wish to make a donation in memory of a deceased person, please identify the name of this person, as well as the full name and address of the person to notify in the form provided for this purpose. If you make a donation via our online form, you will receive a confirmation email with your official receipt immediately after the transaction. If you send us a donation by mail, please count approximately four (4) weeks to receive your official receipt. Do I get a tax receipt when I make a donation? Yes. As a registered charity, the Mira Foundation gives tax receipts for donations of $20 or more. For donations of less than $20, a tax receipt is issued upon request only. The Mira Foundation prepares official donation receipts that meet Income Tax Act requirements and regulations, as detailed by the Canada Revenue Agency (CRA). If you would like additional information on tax laws, see the Making a donation section at the Canada Revenue Agency. Why do males have to stay at Mira instead of being placed in foster families like females? From a behavioural point of view, it can be difficult to keep males at home. An unneutered male will tend to mark his territory inside the home, for example. In addition, coordinating males’ transportation to headquarters in conjunction with females’ ovulation would make the breeding process much more complicated. Furthermore, keeping the males together at the Mira St-Césaire kennel also stimulates them. What happens to the dog after its seven years of work? The dog is placed in the beneficiary’s entourage. The dog can sometimes work more or less than seven years, depending on each case. If it cannot be placed in the beneficiary's entourage, the foster family is invited to adopt it. At what age do puppies arrive in their foster families? Do guide or service dogs have time to play? Yes, when they aren't working, like other pets do. What age was the youngest ASD beneficiary? How much does a person with a disability pay to obtain a dog? Absolutely nothing! Mira services to beneficiaries are offered free of charge. How many words do guide dogs and service dogs understand? Can you give examples? This can vary from one beneficiary to another. Dogs respond to basic verbal commands such as “go,” “come,” “stay,” “lie down,” “J,” “A,” “turn,” “go eat,” etc. They also respond to hand signals, and understand words such as “no,” “yes,” “good dog,” etc. They can also learn the precise words appropriate to school environments, such as “classroom,” “cafeteria,” “library,” and so forth. If the beneficiary uses the subway, the dog might learn “turnstile” and other words. The list can be very long. We could say that the dogs know an average of more than 50 words used daily. Can service dogs open doors? Yes, service dogs can open doors. However, the doors must have duckbill handles. They open them with their paws or by using their teeth to pull on a cloth attached to the handle. They can also open doors at shopping centres, hospitals, etc: any building with a button to automatically open doors. Dogs can open these doors with their paws or snouts. Dogs are also able to open refrigerator doors. Once again, they do so by using their teeth to pull on a cloth attached to the handle. What types of objects can service dogs fetch for their masters? Service dogs can fetch most of the objects their masters ask them to; keychains, utensils, canes, bank cards, glasses, cans, money, clothing, gloves, boots, slippers, etc. At what age can a child receive a service dog for youth with ASD? We are still assessing what age the child should be for the dog to have the most impact. We work with youth that present an average level of autism, because at low and high levels, the dog is not effective. In adulthood, disorders are less apparent. The major part of our clientele is less than 15 years old, more specifically less than 10 years old, with an average age of 8. At present, we give dogs to persons up to 21 years old. The beneficiary must be autonomous: for example, he or she must be able to go for a walk with the dog. How long does it usually take for a beneficiary to obtain a Mira dog? What is the process of allocating and pairing dogs with their beneficiaries? Mira evaluates all applicants in partnership with psychoeducators and specialists in mobility, orientation or rehabilitation. Depending on the program, the person is assessed for approximately two days at Mira's headquarters on the following points: pathology, travel and daily requirements, living environment, potential contribution of the dog, etc. 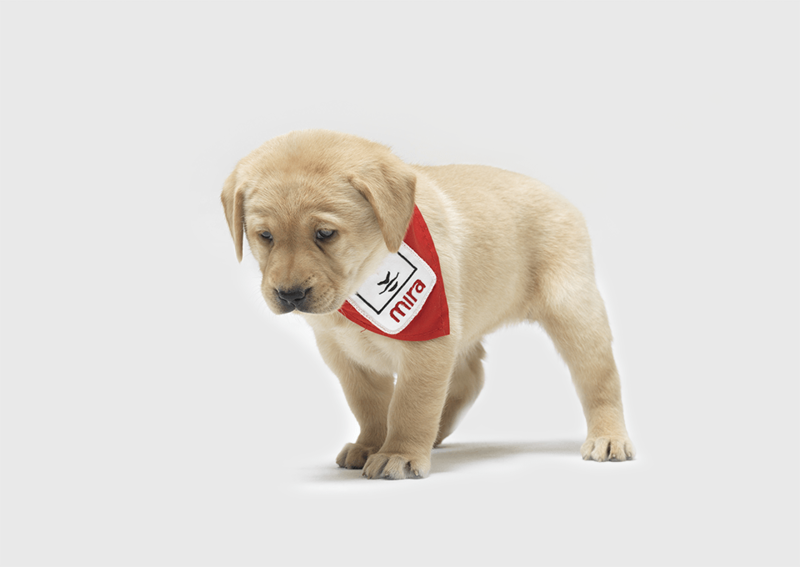 Once the applicant is accepted as a a Mira dog beneficiary, he or she will stay at Mira's facility for four weeks free of charge to follow a special course, which is given in groups. We must find the dog that is best suited for the beneficiary, based on the results of the preliminary assessment and the observations made at the beginning of the course (travel, speed, contact, personality, etc.). The goal of the course is to form an effective and safe beneficiary/dog team. After the course, instructors go to the beneficiary's home to perform the integration follow-up. Subsequently, two full-time travelling instructors take over and make sure that working dogs are functioning properly and are healthy. I would like to do a school project on Mira. May I obtain information? Absolutely. Please contact us at info@mira.ca, and we will send you documentation, video links and photos. However, you cannot visit Mira’s facilities. Is it possible to visit Mira facilities? In order to respect our beneficiaries’ privacy and for our courses and dog training to operate properly, we cannot welcome visitors. However, we hold an open house once a year during the summer so that visitors can see the magnitude of our services and discuss with Mira staff members. To know the date of the next open house and reserve your spot, please contact us at info@mira.ca. What is the difference between the Labernese and the St-Pierre? The Labernese is a cross between a Labrador and a Bernese mountain dog. It sometimes has short or long fur in different colours, which are black, blond, tricolor and black and white. The St-Pierre is bred with two Labernese. Where can I buy a Labernese or a St-Pierre? The Labernese and St-Pierre are not breeds, they are hybrids resulting from crossing Labradors and Bernese mountain dogs. Given that this is not a breed, there are no Labernese or St-Pierre breeders. What is a rehabilitation dog? Mira dogs work with the City of Sherbrooke Police and the Sûreté du Québec to help investigators intervene with young victims of aggression. A dog also works with the youth services (DPJ) in Longueuil, and at the Maison du père de Montréal. These dogs promote interaction with the clientele. How can I distinguish between Mira dogs at work and dogs being socialized in foster families? Working dogs wear a harness, which is their official identification. Dogs in foster families wear a red scarf with the Mira logo. If the information you seek is missing, please contact a member of our team.